Description: The common dragonet has a rather flattened head and body and when viewed from above the head is almost triangular in shape. The pelvic fins are large and are held expanded. The eyes are close together and on top of the head. There are two dorsal fins, the first is triangular shaped and in males the first fin ray is very long. Females and immature males are usually pale brown with a series of six darker blotches along the sides and three conspicuous saddle-like markings across the back. Males have numerous blue spots and stripes on their bodies and fins. This is the largest of the dragonet species with females growing to 20cm in length and males growing to 30cm. 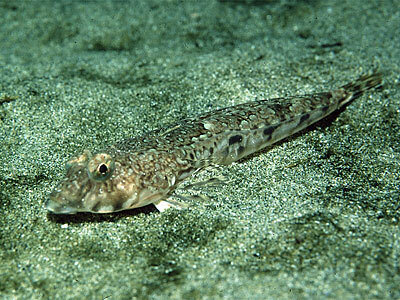 Habitat: The common dragonet is usually found on sandy or muddy sebeds from a few metres depth down to 200m. It feeds on bottom-living crustaceans, worms and molluscs. Similar Species: The reticulated dragonet (Callionymus reticulatus) is similar but has a much darker outline bordering the saddle-markings and is usually found on coarse sand or gravel. Picton, B.E. & Morrow, C.C. (2016). Callionymus lyra (Linnaeus, 1758). [In] Encyclopedia of Marine Life of Britain and Ireland.